FontExplorer X Pro 2.0.1 is the most advanced, feature-complete font-management tool I've ever seen—and I've used almost all of them. It's as if the developers asked hundreds of designers and prepress professionals what they wanted, and then delivered everything on the list. But that's not to say it's bloated with features—in its default setup, FontExplorer X is straightforward and easy to use. But when you need to customize it, you'll find hundreds of ways to do so. The program’s interface will be familiar to anyone who has used iTunes: it has font sets on the left, a font list on the right, type samples at the bottom, and details in the lower left-hand corner about any selected font. The top toolbar gives users access to common functions and may be customized to include your favorite features. You can even apply colored labels to any font. In fact, almost every feature is customizable, from the details displayed in the window to exactly how you want the program to behave when you add, remove, activate, or deactivate fonts. Adding fonts is as simple as dragging them onto the FontExplorer X window. You can choose whether the program copies the fonts into its own Archive folder or moves them (thus deleting the original files). You can also leave the font files in place on your hard drive and let the program simply point to them. 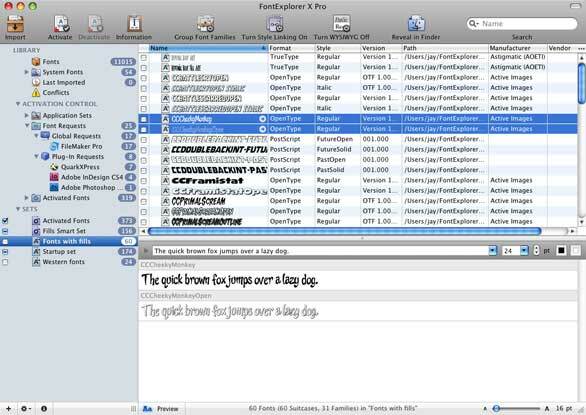 You may also purchase fonts from within FontExplorer X in a process very similar to using the iTunes Store. But the impressive thing about FontExplorer X is the level of control you have over how imported fonts are treated. 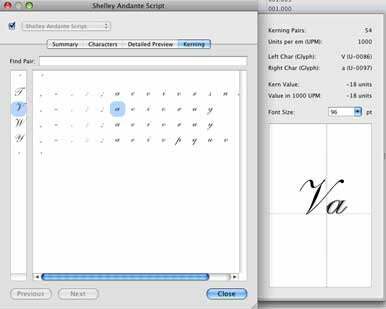 Creating and adding fonts to sets is simple, and smart sets provide a real-time collection of all the fonts that contain specific characteristics. One welcome feature is Application Sets, which can activate certain fonts when a specific application is launched, and then optionally deactivate them when the application quits. Another is the Font Detector, available under the File menu. It can identify fonts used in many kinds of documents, including RTF, PDF, EPS, SVG, Adobe InDesign CS2/CS3/CS4, and Apple Pages and Keynote. It can then create a new set from those fonts, activate them, or even let you purchase them if they're not already in your library. The Summary window shows a deep level of detail about the font. When you double-click a font name, a window opens that provides all the information about that font—its manufacturer, version number, and even details about your use of it. It also has a unique character viewer that shows every character the font includes; when you select one, it appears on a grid that indicates its baseline and side bearings. The Unicode tab lists all the character sets available in a particular font—Latin or other language sets, number forms, dingbats, superscripts and subscripts, and alternate glyphs, for example. There's also a detailed Preview pane that shows a sample of the font in your choice of color, with or without built-in kerning or extended ligatures applied, and with your choice of tracking applied. And hard-core font geeks can even see details about how the font designer assigned kerning pairs, so you'll know how two specific letters will fit next to each other with kerning turned on or off in your page-layout application. You can drag samples from a sample pane to the desktop, where they will be saved as images in PDF, GIF, TIF, JPG, or PNG format, either as separate image files or as one big image file. There is no way to print font specimen pages from within FontExplorer X, but if you save the previews in PDF format, the resulting files are resolution-independent for printing on any printer. True font geeks can even select two characters and see their positions with kerning turned on and off. You can tell FontExplorer X to intercept font requests from any or all applications, and then either activate them automatically or not in almost any combination. It also ships with auto-activation plug-ins for QuarkXPress ( ) 6.5, 7, and 8; and for Adobe InDesign ( ), Illustrator ( ) CS through CS4, and Photoshop ( ) CS3 and CS4. One of my favorite features is that it keeps track of which fonts each application has requested for activation. That makes it much easier to figure out which fonts to keep activated all the time. FontExplorer X can export a backup of all your preferences and fonts, and then restore them on your Mac or copy them to another Mac. It can also export your current window configuration, which can then be applied in whole or in part on another Mac. It can even create a Quick Installer of your configuration and fonts to install on other computers. These features make it much easier to set up and support multiple designers in a workgroup, or to give you peace of mind that your carefully crafted font environment can be quickly recreated in an emergency—or on your laptop. The program has tools to clear your Mac's font caches, optimize the database, and manage plug-ins. The plug-ins manager is especially useful, because if the plug-ins are updated during an overall FontExplorer X update, they can be automatically pushed out to the applications that use them. Just like other leading font managers, FontExplorer X employs two programs: an invisible engine that activates at log-in to handle activation requests, and the application itself, which lets you manage your fonts and sets. Organizations with more than a few users will want to employ the server version of FontExplorer X. The server can run on any computer, and is administered through the client program. The server lets you set up users and groups, and assign any combination of privileges to them. If your corporate server has an LDAP directory, it can import all the users and groups from it. 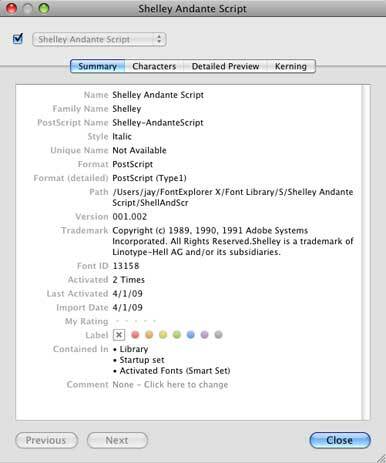 A power user can choose to see plenty of information; note that the Activation Control area shows which fonts were requested by which applications. It installs as a preference pane on your Mac, and simply adds new features to the FontExplorer X client on that Mac. Fonts stored on the server are copied to local computers when activated, but in a form that can’t be shared with others; and access time can be limited so as not to run afoul of licensing agreements. This is handy for laptop users who need to work away from the local network. I am impressed by the speed of FontExplorer X Pro 2.0.1—especially when importing fonts and displaying fonts in WYSIWYG mode. Its feature set reaches far beyond its competitors’ in the level of detail it shows users, the level of control it allows when importing fonts and during auto-activation, the tracking of auto-activation requests, the sharing and exporting of configurations, and more. And yet it remains approachable for most users. I recommend it to anyone with more than a casual interest in managing their fonts.